Charles Hall et les "Grands Blancs"
Aliens ‘The Tall Whites’ are among us They Are Among Us. 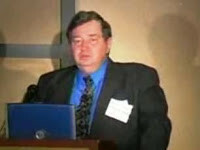 Charles Hall, a nuclear physicist, ex-military American weather specialist and author is touring Australia with his claims that the United States military has been in contact with an alien species for years. He says the aliens would dress as humans and visit Las Vegas. 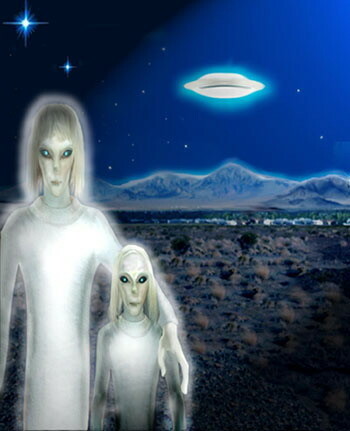 ”In 1964, when I was a weather observer at Nellis Air Force Base in Nevada, I witnessed interactions between the military and a group of mysterious tall, white, human-like extra-terrestrials,” the Vietnam veteran said from his home in Albuquerque. ”Their craft are capable of travelling faster than the speed of light because Einstein was wrong about relativity.” Mr Hall said no cameras were allowed at the site, which has since been wiped off the map. When he arrived, a colleague had wanted to lock them in the weather station and not go to the other end of the building ”because that’s where he had encountered them. There was a group of five, two men and three women, and they had come to go to the bathroom. ”When you encounter the ‘tall whites’ it’s such a shock, you are not sure if you are looking at a ghost or an angel, or if you are dreaming,” he said. Mr Hall said he had contact with three types of aliens – the ”tall whites” (about 2.5 metres tall), ”greys” (with yellow/orange skin) and the ”Norwegians with 24 teeth”, who look like humans and speak English. he claims that the experiences were real and that the US Air Force were indeed hosting extraterrestrials they had reached agreements with during the 1950′s if not earlier. They were principally involved in technology transfers with the US military. He said US officials had kept it all quiet because people weren’t ”emotionally ready” to accept alien life forms. The tall whites are humanoid in appearance. The first UFO researcher to seriously investigate the Charles Hall story is Paola Harris who interviewed him in July 2003: “I enlisted in the USAF in July 1964. After completing basic training at Lackland AFB in San Antonio, Texas, I was trained as a USAF weather observer at USAF Weather Training School at Chanute AFB, Illinois. My duties were that of a USAF weather observer during my entire service in the USAF. In late March or early April of 1965, I was assigned to the weather squadron stationed at Nellis AFB at Las Vegas, Nevada. I was stationed at Nellis AFB from the early spring of 1965 until May 1967. While I was permanently stationed at Nellis AFB, Nevada, I was assigned to several temporary tours of duty as the duty weather observer to the Nellis gunnery ranges that are located at Indian Springs, Nevada. ” Airman First Class Charles Hall was Range Weather Observer for several gunnery ranges between 1965 and 1967. These places were located in the hot desert and probably looked very quiet and isolated as well. Hall’s duty was simple: to release and track weather balloons, measure the winds, and call in reports to Nellis. His job could have been plain simple if the aliens Hall calls the Tall Whites weren’t often around, silently observing him. The Tall White extraterrestrials could freely come and go, even in the barracks and in the weather shacks. Charles Hall believes that these aliens have been on Earth since at least the early 1950′s, and possibly as long as a hundred years or more. Hall: “I believe that the tall whites were associated with the 1954 Eisenhower-ET meetings and that they subsequently established their base in the Indian Springs area of Nevada in that time period.” Following Hall, he was assigned to the ranges with some unusual conditions: no one could order him off the ranges but he was to be alone out there. No one was allowed to ask him questions regarding his job. He was given the surname “Teacher’s Pet”, a kind of special ID. Hall’s first contacts were traumatic to say the least. He simply refused to believe what he saw, even though others before him spotted the Tall Whites. In fact, not being the first Weather Observer to be assigned at the ranges, previous reports mentioned ghosts and a radioactive horse. Many were scared and injured until they simply refused to go back to the Ranges.With time and much self control, he got used to some Tall Whites known as Range Four Harry, Captain, Tour Guide and a female known as Teacher (a very influential Tall White). Hall was told by the Teacher he was chosen by the Tall Whites as another guinea-pig to try to accustom humans and Tall Whites together. While all other trials failed, Hall somehow passed the test. That’s why he was identified as “Teacher’s Pet”! Hall, contrary to the other Weather Observers, didn’t panic when in front of a Tall White.The Tall Whites have a base right in the desert, way beyond Range 4. From the Millennial Hospitality books, it is clear there are relationships between them and the US Government. Many times, Hall saw the aliens along with US Generals. The Tall Whites themselves revealed him how they agreed a commercial treaty: the US provided clothes, a base and other resources, in exchange of some advanced scientific knowledge.Appearance of the Tall Whites Charles Hall describes the Tall Whites as pale, with chalk white skin and possessing a thin, frail body. Quoting Hall himself: “They had the usual thin frail body build, chalk white skin, large blue eyes, and nearly transparent platinum blonde hair. Like all of the tall whites, their eyes were perhaps twice the size of human eyes and they stetched noticeably further around the sides of their heads than human eyes do.” It is curious to notice the eyes change colour, from blue to pink, as they grow older. The Tall Whites are between 1.82 and 2.18 meters tall. Following Hall, the Tall Whites undergo a second stage of growth at 400 years old, until reaching the age of 800. Their language sounds like dog barking, even though they have learned English. Not much is known about their biology, if not that their bones take much much longer to heal. The Teacher once confessed Hall she required 5 years to recover from a bone fracture! A Tall White’s brain can process informations twice as fast, outperforming anyone’s reflexes. They can run faster than humans as well. Judging from the above description, their home planet (Hall hints at Arcturus) must be a warm, desert-like atmosphere (that’s why they chose the Nevada desert). Interacting with the Tall Whites The Tall Whites must be excellent warriors and strategists. Their lives are centered around their children. They heavily protect them; injuring one would be a deadly mistake. Their culture seems almost military like: great importance and respect is given to social positions and hierarchies (them being kind to the Generals but snobby to plain soldiers). Additionally, many Tall Whites appear to be very proud, therefore they don’t hesitate to kill: Hall: “Then the guard said forcefully, “You know that if anything goes wrong with this plan we can kill you any time we want to” Standing my ground still shaking in fear, I replied, “Yes, but I haven’t given you any reason to kill me…” The guard smiled and replied, “You are quite right. We could have killed you in your shack the other night if we had wanted to.” All this leads me to think interacting with a Tall White requires an overdose of attention: the wrong words or sudden actions may easily offend a Tall White. It is now very clear why Hall remained calm and maintained distances, when they were around. Hall himself could anytime be subjected to harsh treatment if he inadvertently harmed, scared or disrupted the Tall Whites. Eventually, he was shot by a Tall White female named Pamela. On that occasion, no other Tall White helped Charles Hall (Captain even told him he was going to die! ), even though he was the Pet… “Hall describes the Tall Whites as quite intimidating in terms of behavior and how they regularly stalked military servicemen on duty at the remote desert location where Hall served. The Tall Whites regularly caused powerful emotions of fear and even terror among the military servicemen who didn’t understand these Extraterrestrials or weren’t ready to interact with them in a friendly way. Yet the Tall Whites were also capable of exhibiting friendship qualities and of being teachers as in the case of Hall.” A dual behaviour for sure: aggressive and friendly… It’s quite clear how controlling these Tall White are. Not to forget the condescending attitude they have for those humans who have done them a service. Judging from the above quote, Hall gained the trust of some Tall Whites by showing them he was not interfering with their plans: he let them control him. Yet, they fear our mental ability to multi-task. If they really exist, it is easy to image the fragile position of the US military, dealing with a race like the Tall Whites.